Welcome back to Wow Us Wednesdays. It was good to take last week off as I surely needed it and especially while traveling. I just didn't want to lug my laptop with me. This week instead of sharing three features I'm sharing the most viewed link from the last party which is this beautiful spring bedroom by Housepitality Designs. It's nice to have you back, but I am glad you made the right decision to just take a breather to catch up with life. I hope things are going well with your mother. What a most pleasant surprise! Thank you for the feature!...Again, thanks for hosting and have a great day Kim!!! Shirley's bedroom is lovely. Thanks for hosting. Shirley has indeed the most beautiful bedroom. I can see why it was the most viewed! I just love Shirley's bedroom! Thanks for hosting and I hope you are feeling refreshed after your getaway! glad you got a little time off, thanks for having us over, Kim. Hi Kim - thanks for hosting, Wow Us Wednesdays! I'm glad you had a good trip. Enjoy the rest of your week. Thank you for hosting. I love all of the springy decor this week. Thanks so much for hosting! I hope you had a wonderful vacation. 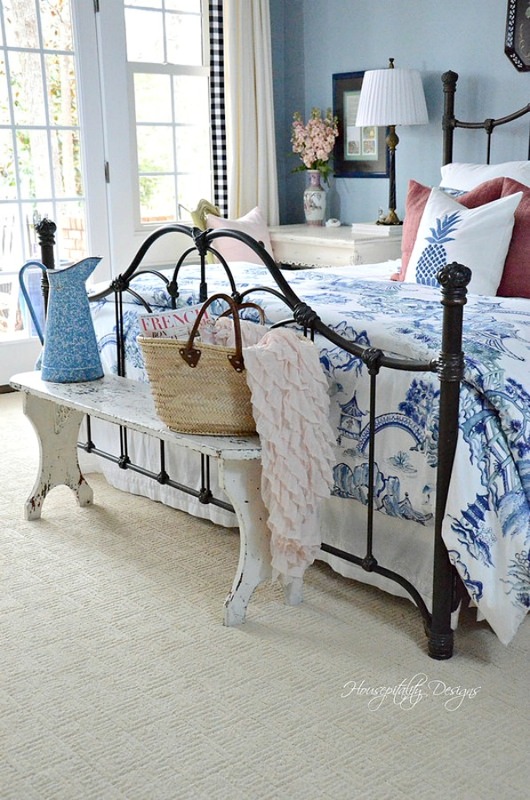 LOVE that spring bedroom! Thank you for hosting another great party. Hope it was a lovely vacation and that blue and white bedroom is dreamy! Love Shirley's pretty bedroom. Thanks so much fo hosting and welcome back! Love the blue walls in the bedroom. What color paint is that? That isn't my bedroom, but a feature. If you will click on the link below it then you can ask the owner what the color is.